A cold and very windy start to the day at the Geyser Pass Trailhead. Winds in the low elevations were moderate with small trees swaying and plenty of drifting snow. Daytime highs in the 20's. Skies were obscured for most of the day. Partial clearing after about 4 PM. Sheltered terrain still offers powder and soft snow. Wind scouring and wind drifts found in most open terrain. The biggest story of the day was by far the wind. Driving up the Geyser pass road we experienced moderate winds and lots of drifting snow. Fresh drifts were visible along road cuts. The road cut on the final turn before the parking lot was freshly loaded. We brought the class down and walked across this road cut and had shooting cracks and windslabs breaking out all over the slope. This northwest facing road cut at low elevation was great information for what mid and upper elevation north facing slopes might have looked like today. It can be assumed from this ob, that as much or more wind loading is occurring up high on north and east faces. Snow pits dug on north facing slopes are still showing a poor snowpack structure with a slab in place over persistent weak layers. We knew wind drifted snow would be a problem today before we even reached the parking lot. Moderate to strong winds out of the SW were drifting snow even at low elevations. The SW winds have been relentless all week long and with plenty of snow available for transport, N and E facing slopes continue to be loaded with fresh drifts. Today we dug our pits on low elevation North facing slopes. Persistent weak layers are present in the snow pack even at low elevations. These layers reacted to stability testing today. 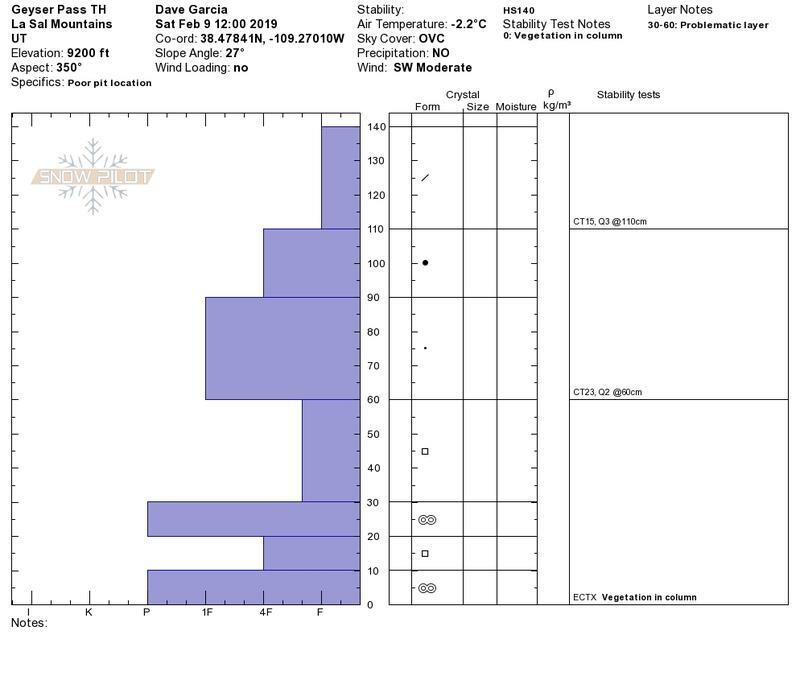 The December facets below the snow that starting falling the night of 12/25 failed a compression test at CT23 Q2 RP. We conducted an ECT to see if we could get propagation on this layer. We did not get propagation (ECTX). However there was a small shrub sticking through the weak layer into our column of snow. And this definitely influenced our results. I believe we would have seen a failure on this layer. We talked about how if we were truly evaluating north facing slopes to ski, we would dig another pit in an area free of vegetation and conduct another ECT. Today we stayed at low elevations and pit sites were limited. Bottom line, persistent layers are still reacting and we're not ready to trust them. Thanks Tomasz for drawing this snow profile in your notes today. A great day in the mountains with the 101 class. Thanks to everyone who participated today. See you on the slopes! Considerable danger for wind drifted snow in Upper and Mid elevation terrain.